Prebiotic fibres (beet pulp and flaxseed blend) - promotes growth of beneficial bacteria and helps normalise intestinal microflora. 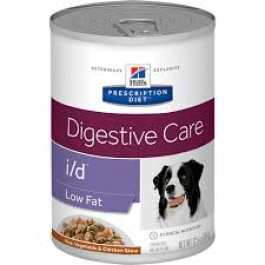 Hill's Prescription Diet i/d Canine Low Fat should be recommended by your veterinary surgeon. For detailed information on feeding amounts and how this food can help your pet, please consult your veterinary surgeon. Exclusively feed the recommended Prescription Diet food and keep fresh water availalbe at all times. Please note that this is a guide only and that individual animals may have different requirements. Adjust the feeding amount to maintain the optimal body weight.&nbsp;When feeding for the first time, mix increasing amounts of the pet's new food with decreasing amounts of the old food over a 7-day period.